Cauliflower soup with both charred and pickled cauliflower–stellar layering. 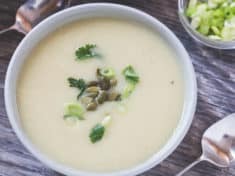 You will love the amazing depth of flavor in this rich vegan and gluten free roasted cauliflower and white bean chowder. Use the Instant Pot pressure cooker to cut simmer time by a third. Darkly blistered cauliflower, from the oven or your grill, gets this tasty slurpable vegetable chowder started. Chunky with potatoes and white beans, it’s finished with wilted sharp bitter spinach and a salty lemony cauliflower relish. The cauliflower is used 3 ways. 1/3 cup is for the pickled relish, 2 slabs are charred, and the remainder gets coarsely chopped and cooked in the broth with the potato. After the vegetables are tender, blend some of them with the broth, for creamy-chunky chowder-y-ness. Both spinach and parsley add eye-catching color. 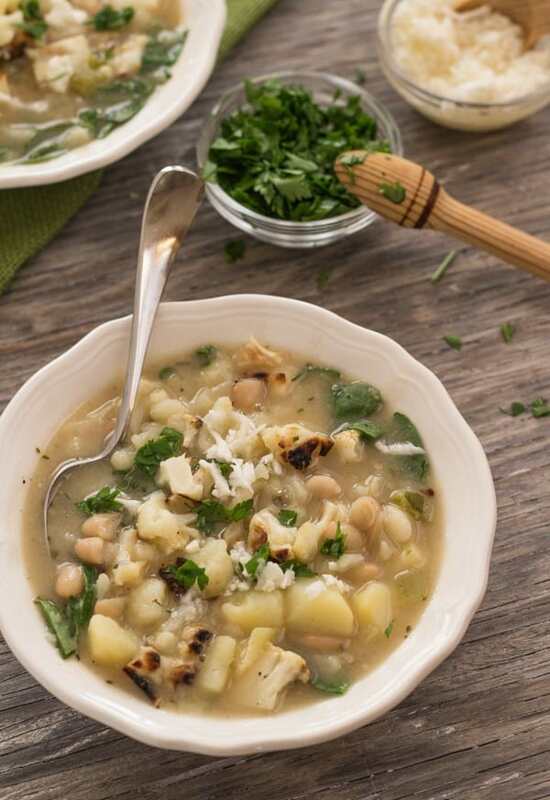 There’s enough protein from the tender white beans to make it a simple dinner soup. 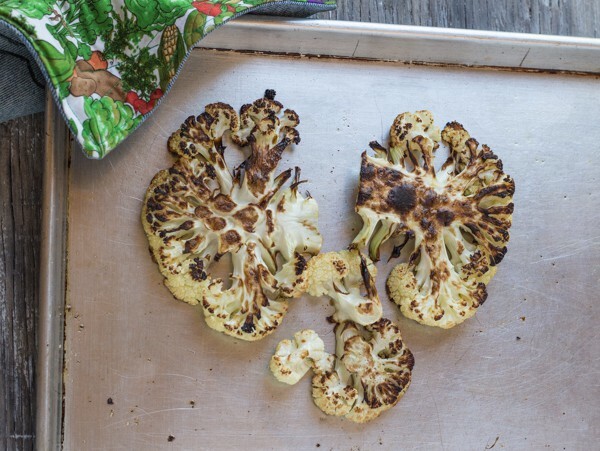 Char the cauliflower slabs under a broiler, or on a grill, high flame. Be sure to puree a portion of the cooked veggies with the hot broth, then pour it back into the pot. That step turns what would be soup, into chowdery thick and chunky. Use the pressure cooker to cut the “simmer” time down. Quick release after 6 minutes under pressure. Keep it easy: For broth, use instant vegetable bouillon dissolved in hot water. Loosely adapted from a recipe by Amanda Cohen of Dirt Candy, the New York restaurant. Dirt Candy—can you dig that name for a vegetarian restaurant? 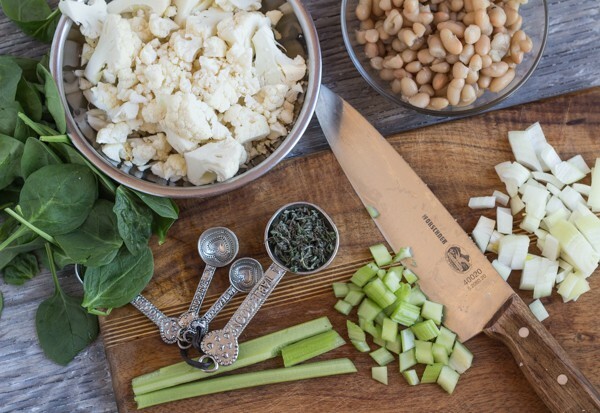 Chef Amanda tops her stew with grated cheddar cheese, which would play well with cauliflower and white beans. 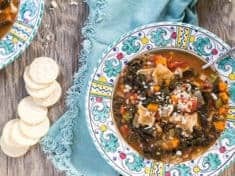 I left out the cheese garnish to make this soup vegan. If you eat cheese, bring in that salty creamy dimension. Dirt Candy, the cookbook, illustrated in black and white comic-style graphics, teems with tricks to transform vegetables from ordinary sides to daring enticing meals. What’s your recipe inspiration? Run with it! Get in the kitchen and cook something delicious! 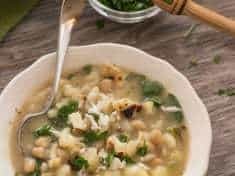 Tasty and slurpable, chunky with potatoes, beans, and cauliflower, with stellar flavor balance, this hefty roasted cauliflower and white bean chowder satisfies the tummy. Times are for pressure cooking--add 12 more minutes for regular stovetop cooking. Remove the leaves from the cauliflower. Grate about 1/3 cup from the head of cauliflower. Put the gratings in a small bowl with the lemon juice and the 1/8 teaspoon of salt. Set aside. Cook the slabs until they are nicely charred on one side, and then turn over and char the other side. That will take about 10 minutes. Let slices cool, and then roughly chop them. Set aside. Coarsely chop the remaining cauliflower. 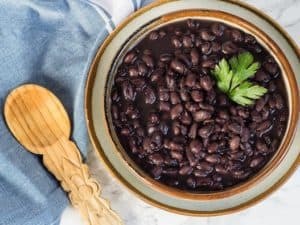 Heat the oil in the Instant Pot. Saute the onions, celery, garlic, coriander, mustard, thyme, and cayenne. Cook, stirring, until vegetables are soft, 4 to 5 minutes. Alternatively, heat the oil in a large pot or stovetop pressure cooker over medium flame. Saute the onions, celery, garlic, coriander, mustard, thyme, and cayenne. Cook, stirring, until vegetables are soft, 4 to 5 minutes. Add the vegetable broth, the coarsely chopped raw cauliflower, and the potato. Press the Manual button on the Instant Pot and set the timer for 6 minutes. If using a stovetop pressure cooker, after the pot is up to pressure, set the timer for 6 minutes. When time is up, turn the dial to vent on the Instant Pot, or quick release a stovetop pressure cooker under cold water. 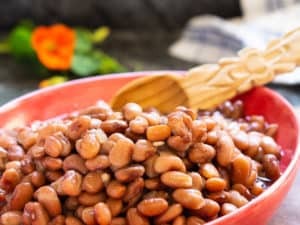 Stir in the white beans. For regular stove-top, bring the broth, coarsely chopped raw cauliflower and potato to a simmer and cook 15 to 18 minutes. When the potato is tender, stir in the white beans. Pour the blended mixture back into the pot. Stir in the chopped charred cauliflower. Simmer about 5 minutes. Season to taste with salt and and plenty of freshly ground pepper. To serve, divide the spinach between 4 bowls and ladle hot soup on top. Top with the chopped parsley and the grated cauliflower that has been “pickling” in lemon and salt. The cauliflower is used 3 ways. 1/3 cup is for the pickled relish, 2 slabs are charred, and the remainder is coarsely chopped and cooked in the broth with the potato. Amount of salt depends on the saltiness of your broth. Start with 1/2 teaspoon salt.